One night of blissful, hearty rain in Delhi, and what do you wake up to? A mock flood, that's what. And I use the word 'mock' because that's exactly what it is: a totally unnecessary exaggeration of things as they really stand. So, today morning there was chaos (again!) as people were caught in freak traffic as they maneuvered the waterways of Delhi that connected one place to another. But the unfortunate part is that it was 'borne' with such a fuss, as if a little water here and there was the end of the world. I say, how typically pretentious of Delhiwallas. Especially at a time when most parts of our country are really flooded. Not to speak of the local TV channels who played looped footage of water flowing across in some gully and mohalla of the city. Of course, I say all this with an undercurrent of sympathy for commuters who were actually delayed by hours (many of my friends were hostage to traffic jams). Traffic in Delhi is really strange. It's like that scene in The Truman Show where Jim Carrey is driving down an isolated road, and suddenly a host of cars just appear out of nowhere. Believe me, it is as exasperating as that. And the reason for these traffic jams are stranger - whether it's an increase in diesel prices or a little bit of rain. All the same, it's usually inexplicable. Thanks to the waterlogged roads in Delhi, Blue line busses are finding it hard to hit people. I hope water doesn't seeps through to the metro rail lines! 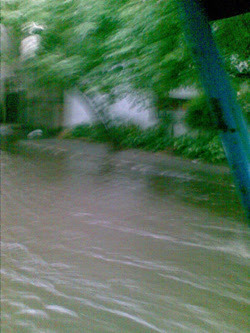 Well it was interesting for us as the reality of a flooded basement office hit us when we reached there. And the process of shifting office premises had to be brought forward - what with cartons of books and papers bearing brunt of overflowing drains.